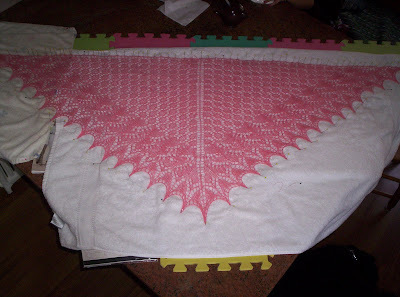 Firstly, I'm not a fast knitter. Secondly, we lived together since April. 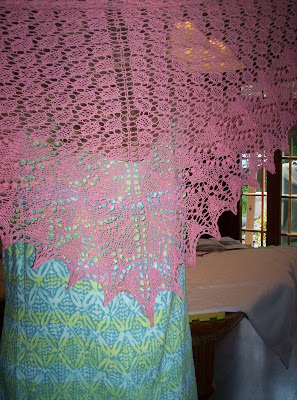 No marathon sessions, just a slow, easy lace knit. Some points to mention - I enjoyed the yarn. 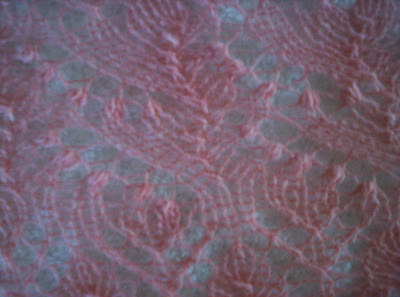 It had a bit of a thick/thin thing happening which made it less slippery than other wool lace yarns I used, which was good. I wasn't crazy about the transition to the Lily of the Valley border, but in the end, the little thing bloomed quite nicely. It really grew! And last night I gave it to my sister for her birthday. She loved it! It's very peachy on her, more pink on me. Son played "Happy Birthday" on his saxaphone - a real sinus opener, and 5 year old daughter did a dance and made her a rather large beaded necklace. We all had cake, which I'm paying for today (I'm wheat and gluten intolerant). So now I'm on to finishing some other things on my sidebar, and revving up the engines for MS3. 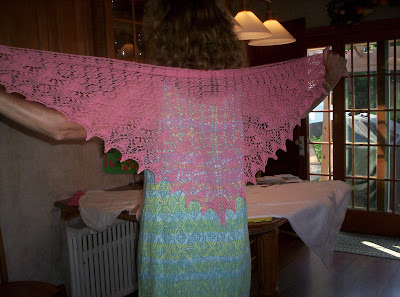 Your lace shawl is absolutely gorgeous!! 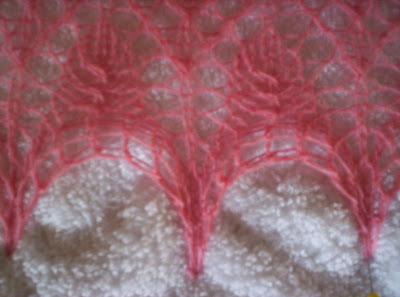 Can't wait now to start on my first lace project. I am so impressed especially now that I have seen the finished product. You need to give yourself a GREAT big pat on the back. That is gorgeous! 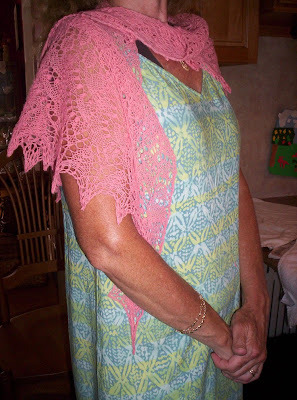 I've heard so much about this particular shawl. My cousin is getting married next year. Maybe I'll make one for her.